The signs of the times are ever before us. The news is depressing at best and down-right scary at worse. Many are left without hope. They have nowhere to turn, no answers, and merely an unwelcoming future. I can see why many are disheartened. But the truth is that there is hope. There is hope when the financial market collapses. There is hope when the environment rages. There is hope when the political leaders fail. There is hope when your entire world crumbles. In a world full of despair it is refreshing to read a book that shines a light on that hope. That is just the type of book that Dr. David Jeremiah wrote in Living with Confidence in a Chaotic World. 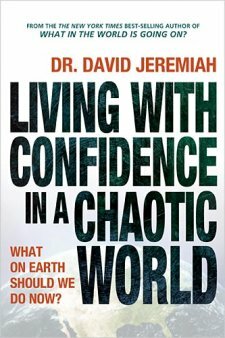 In a striking contrast to his book, What in the World is Going on?, Dr. Jeremiah delivers a message of hope that is imperative for the troubled soul. In it he lays before us a plan of living the Christian life in this uneasy world. With the foundation of the Holy Scriptures, he inspires his readers to look beyond the immediate – that which is filled with concern, chaos, confusion, and commotion – and encourages us to lift our eyes to the eternal. Persuading the reader to stay calm, compassionate, constructive, challenged, connected, centered, consistent, committed, and convinced, Living with Confidence in a Chaotic World imparts a spirit of peace and confidence to the weary mind. Do not be troubled; despite the darkness that surrounds us, there is hope in Jesus Christ. The light shines most brilliantly after the fiercest storm. And Living with Confidence in a Chaotic World paints that picture in a very straightforward way. It is a book that I will be recommending to friends this year. Disclosure: Thomas Nelson Publishers has provided me with a complimentary copy of this book in exchange for a honest review. I am not required to write a positive review. The opinions I have expressed are my own.